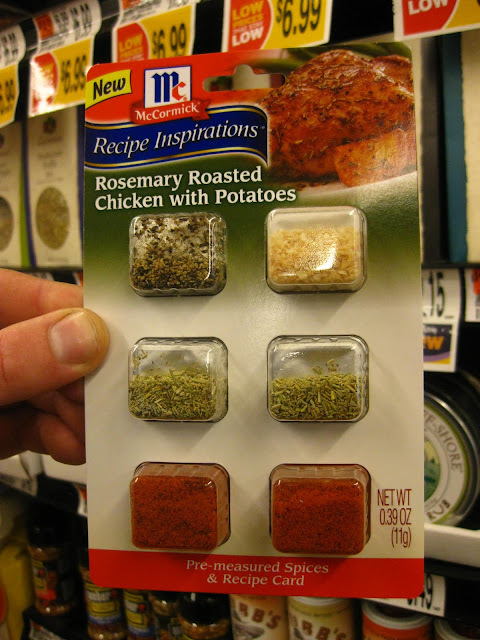 I discovered this horror while shopping at the Hannaford recently; it's a prepackaged spice mix from McCormick titled "Recipe Inspirations." Each one comes with the pre-measured spices you need to make a particular recipe (recipe card included!). Here, you can see "Rosemary Roasted Chicken with Potatoes." The package includes 2 teaspoons paprika, 1 1/2 teaspoons rosemary, 1 teaspoon minced garlic, and 1/2 teaspoon coarse ground pepper. The recipe instructs you to mix all of the spices together with 2 tablespoons of olive oil, and 1 teaspoon of salt (I guess McCormick isn't in the salt business), then toss with 2 pounds of skinless, bone-in chicken thighs and 1/2 pound of cubed red skinned potatoes. Then roast for 30 minutes in a 425 degree oven. I know what you're thinking. Kate, I want one! What else can I make with prepackaged spice mixes!? So I'll tell you; these McCormick spice blends can also hold your hand while you make Apple and Sage Pork Chops, Garlic Lime Fajitas, and Quesadilla Casserole (eeeew). I don't even know where to begin. These spice mixes run about $1.99 and make one meal. For about $.50 you can head over to the bulk spice aisle and get the same amount of spices, if not more, and have enough for several meals. So first of all, it's a waste of money (and that's just the low-hanging fruit argument). Second, it's perpetuating the idea that America is too stupid to cook. Michael Ruhlman sums it up pretty well here, but I'll add an argument made by another Michael (Pollan)—that the marketing of whole foods isn't profitable, and therefore, companies must create more and more value-added products. This spice mix is a perfect example. But in order to sell a value-added product, you first need to convince everyone that making a roast chicken is too hard or too time-consuming and that they should buy your shortcut product. Plus, who wants to toss their chicken and potatoes in exactly the same spices and roast them for exactly the same amount of time?? Wouldn't everything taste... the same!? 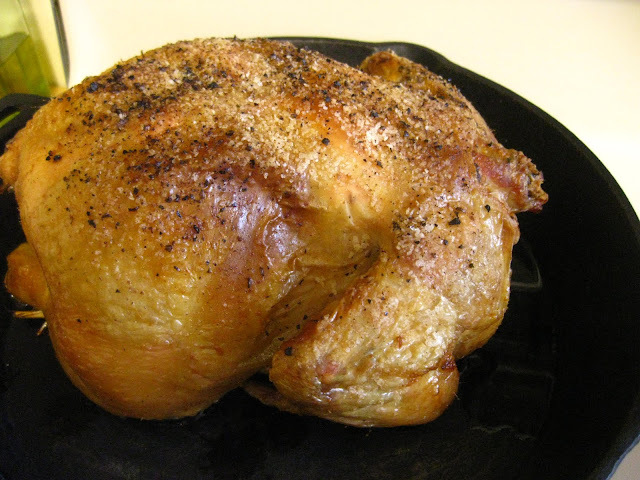 So here's a perfectly roasted chicken (made by M.) to illustrate how easy cooking whole foods from scratch can be. Roast a 3-4 lb. chicken, liberally rubbed with olive oil, butter, and salt and pepper, at 400 degrees F for 20 minutes per pound (about 1 hour) or until the thickest part of the thigh reads 160 degrees F on an instant-read thermometer. Let rest on a cooling rack for 15 minutes, and serve, alongside your favorite roast potatoes. I feel like these things definitely make people think they can't cook. Same with baking mixes. Recently someone I know baked brownies from scratch for the first time and was shocked by how easy it was. Because if it's so easy, why are there so many mixes, right? I'd say "Quesadilla Casserole" is pretty much Mexican Lasagna . . . wouldn't you? Oh it's just sad how dumbed-down cooking gets. I love the bulk spice section of our store and also love making up spice mixtures for just about everything. Creativity in the kitchen is key! Now, now people, let's not all get too far bent out of shape. At least said product results in a home-cooked meal. Hell, I'm gonna get me a meeting with that fine spice maker and see about getting me a deal -- BEFORE they roll out their very own inspired meatball mix. This is a great ingredient for my pizza and chicken recipes. I have a collection of Rosemary Roasted Chicken in to my spice rack too! great post!